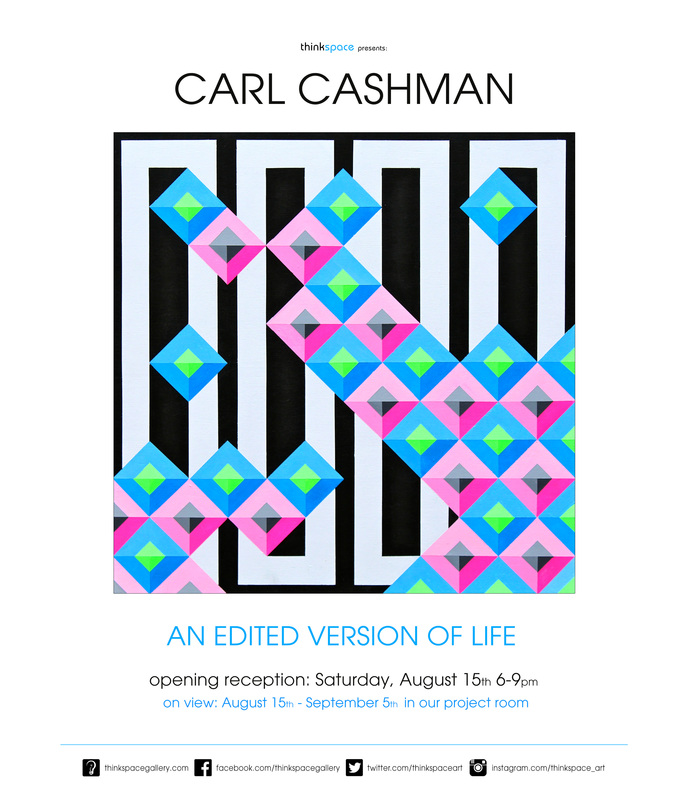 Concurrently on view in the Thinkspace project room are new works by UK-based artist Carl Cashman in An Edited Version of Life. 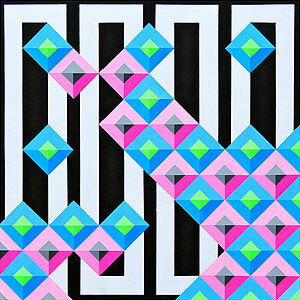 Cashman creates vibrant neon colored op-art, a genre he has coined “neometry”, or neon geometry. The works are hypnotic, at times bordering on the hallucinatory, and blur the distinction between digital and analogue forms. Entirely executed by hand, the paintings are crisp, precise and graphically decisive, though clearly hand crafted rather than digitally produced. Cashman creates his imagery in the absence of any digital means, relying exclusively on a sketch pad, pencil, tape and acrylic paint. These electric hued pieces sit on the cusp somewhere between grid-inspired modernism and contemporary psychedelia. His process relies on the detailed draftsmanship he has perfected in recent years, an emphasis he decided to discipline following an abandoned foray into stencil-based work. Based out of Devon in the UK, Cashman paints primarily on wood panel. He has recently expanded this practice to include works on found objects and repurposed surfaces, such as skateboards and cricket paddles. Using UV reactive paints at times to create an added dimensional effect, Cashman’s abstract geometric imagery often produces the illusion of emitting actual light and movement. Visually hypnotic and entrancing, they’re optically fascinating pieces that seem to hum with energy and depth, interrupting our expectations of real space in a wash of color and illusion.